Getting five people ready for the day is difficult; it's a wonder we ever make it out the door with our whole troupe looking decent. By the time we made it into The District it was past eleven o'clock! I was shocked when I asked Andrew the time—Miriam had woken me up at seven o'clock that morning and we'd been bustling about feeding babies, feeding children, dressing babies, dressing children, packing diaper bags, finding shoes for ten feet, folding up a hide-a-bed, making sure everyone was well pottied ever since. It hardly seemed possible that all we'd managed to do was get out the door and take a short ride on the metro by eleven in the morning! In our defense, we were rather tired from listening to a wild party until the wee hours of the morning. One particular attendee at the party was rather sad and rather drunk and/or high and I suppose a friend was trying to console him when he wailed into the night, "Why me, man? Why me?!" There was much sobbing and incomprehensible mumble-wailing (and loud obnoxious music). Andrew and I giggled and dubbed him Sad Drunk Man. We couldn't stop laughing; I'm sure the man was hurting but it was such a cliche thing to call out (and we were up past any reasonable hour and probably would have laughed at anything). Our metro ride in the morning was as equally interesting as our night. We'd only gone one stop when a man stumbled onto our wagon. "What?! You don't speak Spanish?!" "Uh, no..." Andrew answered. "We speak English." "Well, you should learn it! I have these tapes. Seven tapes for $29. You just listen to them and you learn Spanish." "We're not interested," Andrew said casually. "Hey! Listen what I'm telling you, man!" the man said forcefully. I would say that he yelled that part. Andrew wouldn't. But I'm pretty sure he yelled it. "You have kids! Kids need to learn a foreign language. It's very important. Buy the tapes for the children if you won't buy them for yourself!" "We don't need tapes," Andrew calmly explained. "We can teach our children foreign languages in other ways. We already know foreign languages so instead of listening to tapes we can just speak to our children." "You know foreign languages?! Which ones?!" "I speak Arabic. She speaks Russian." "Oh. Oh, wow. Oh, that is wonderful. You have a good day." The man then stood up to move. I was excited that I wouldn't have to have him sitting kitty-corner from us for the entire metro ride. Unfortunately he moved to sit directly behind me. I smiled awkwardly at Andrew. He smiled back sincerely. 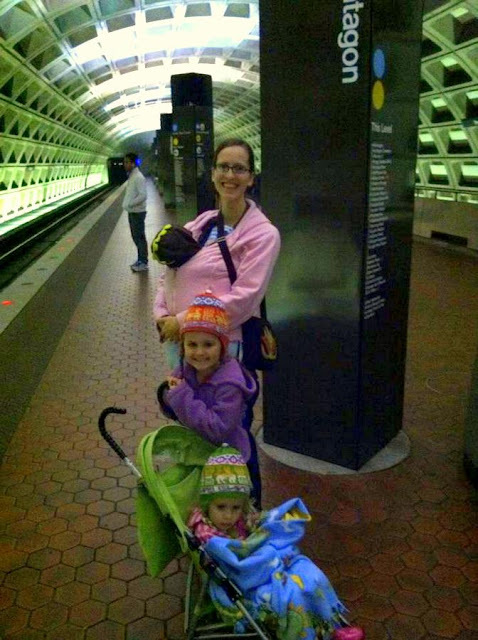 I did my best to interact normally with my children who were fascinated to be on a metro "for the first time." Neither of them remember their metro-riding days in Cairo. And we also may or may not (I'm leaning towards 'may') have told them that the tunnels were carved by basilisks. 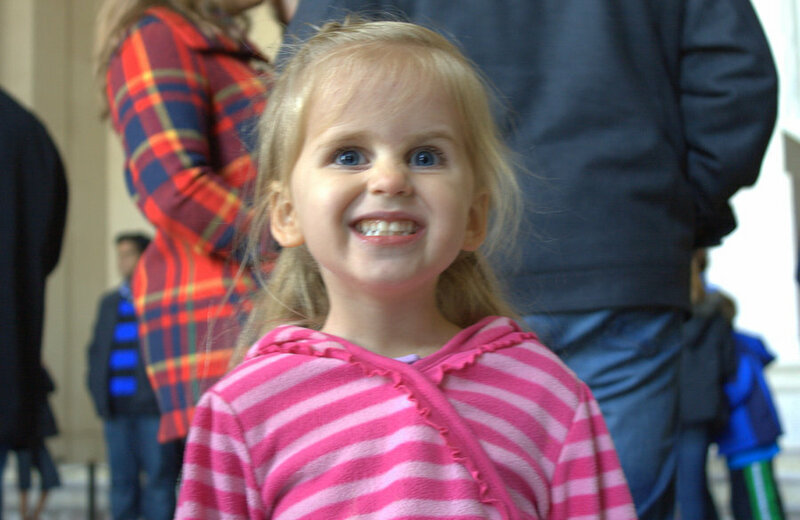 When we went underground the first time Rachel's eyes got large and she gasped, "Oh, no!" I'm not sure she thought we were serious about going underground. "Who is going to kill the basilisk?" she fretted. "Harry Potter is fictional!" "So are basilisks," I reminded her. "Oh, yeah!" she sighed, relaxing into her seat. Just then Tape Man stuck his head over the back of my seat and spoke into my ear. "Hey! You shaid you shpeak Russian so shpeak it to your chil'ren. Nobody'sh goin'a believe you shpeak Russian if you don't shpeak it! And how'sh your chil'ren goin'a learn if you're just shpeakin' English all the time!" I was a teensy bit happy when we got off at Pentagon Station to switch lines because Tape Man stayed behind. I'm really not sure if he was selling tapes; he didn't have any with him and he didn't talk to anyone else on that ride. Just us. We were his special target. Andrew was a teensy bit happy when we emerged from the metro at L'Enfant Plaza. He was more than happy. He was stoked. He loves DC and was excited to share it with me. 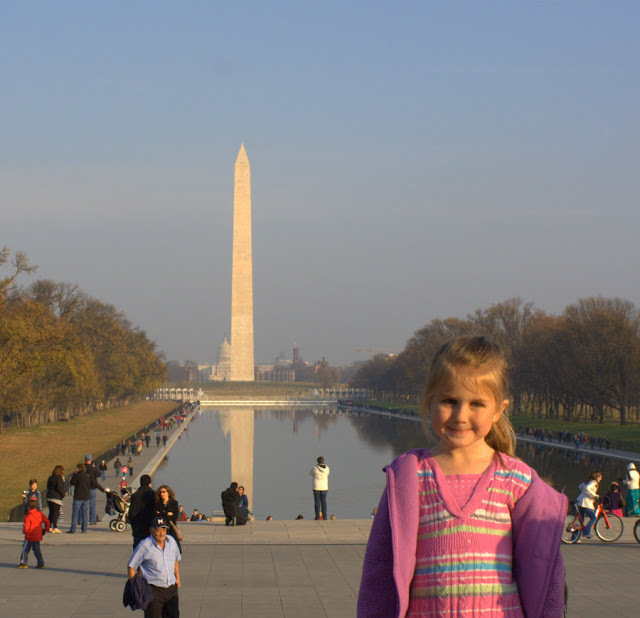 But I hadn't visited either Washington, DC, or Ottawa—my two native capitol cities. It was certainly a bucket-list day for me. (Ottawa's next...not that we actually have concrete plans to go there, but I'd definitely like to go some day). Anyway, Andrew was bouncing with excitement. I was, too. It was hard not to. And not only because we were met with a drum line after we stumbled off the metro escalator. We were actually really excited. We walked along The Mall to the Museum of American History (so that we could find some ruby slippers...and Yoda...and things like that). 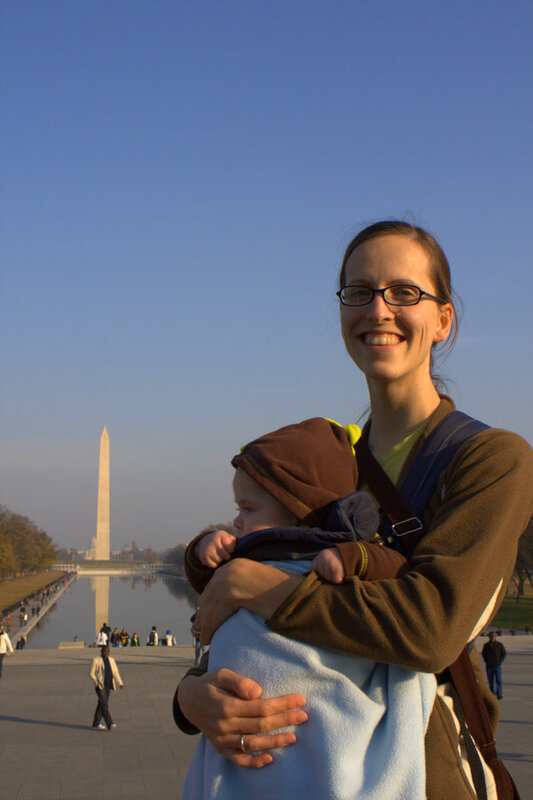 DC is a dream come true for a family with little expendable income. It took a little over a half a tank of gas to get there. We spent a ridiculous amount of money on metro tickets ($14 x 3 for full day passes) but all the museums are free—or at least enough museums are free that you could spend days and days and days wandering around and not spend a single cent on admission fees. Unfortunately we didn't have days and days. We had one day. 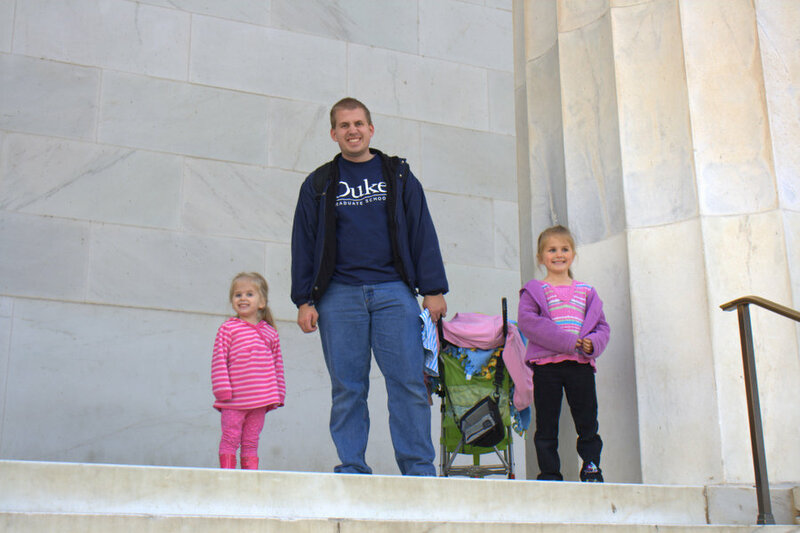 Andrew wanted to take the girls to see both the American History Museum and the Air and Space Museum but even that plan was optimistic. I still want to get back to see the aquarium and the Natural History Museum and...other places. We only went through the American History Museum and it was lovely, though the television wing was closed for renovations which broke the girls' hearts. Andrew has talked about seeing Dorothy's ruby slippers for years so our girls were eager to get to see them for themselves. We had a quick chat about plans changing, circumstances being beyond our control, and choosing to be happy because there was so much more to see and it seemed to work. The girls stifled their sniffles, held their heads high, and walked on. The first exhibit we went through was filled with dresses of the First Ladies, past and current. Miriam, our resident fashionista, could have stayed in that one room all day. Shoes, jewelry, clutches, evening gowns...she was in heaven. I will never understand that child. Next we went through the exhibit of presidents. 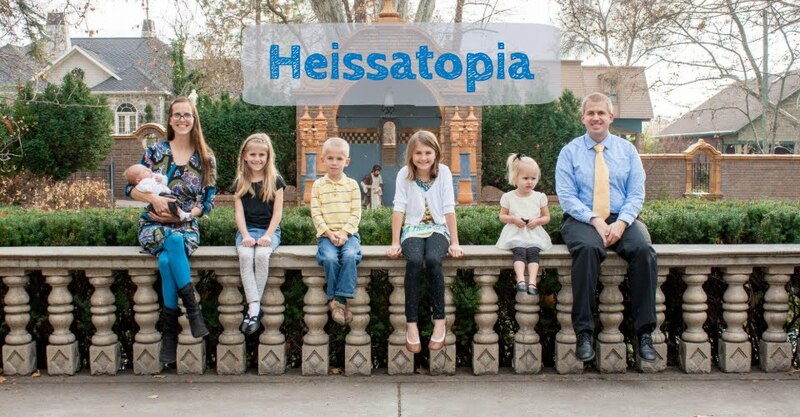 We took turns standing at this podium so we could try reading from a teleprompter. Don't we look presidential? When we finished upstairs—which is all about the history of the presidents and their families, it seemed—we went downstairs and literally ran into the ruby slippers. Our girls melted with joy and ran to the case so they could admire them. It seems the museum knew they were a popular pilgrimage and so they moved them to a special temporary exhibit filled with other things that people often come to see that would have otherwise been locked away in the sections of the museum closed for renovations. Kermit the Frog (was) (t)here, too. And this creepy "Creeping baby doll" were among our favourite items in the exhibit. Who knew that prior to the 1870s crawling had been considered a bad habit "associated with animals and the insane" and thus something people discouraged their children from doing. We went into the basement to learn about transportation throughout history and when we were getting ready to leave we found the Harry Potter robes, which made Rachel's day (once again—easily excited, easily devastated). She had so been hoping to see Yoda and was crushed when we couldn't find him but spotting this turned her feelings right around. "Dad! You said Harry Potter wouldn't be in the museum because Harry Potter isn't American—they all speak that other way! But, look! It's Harry Potter's robes!" It turns out that the costume designer for the robes, Judianna Mokovsky, was born in New Jersey so it was certainly altogether fitting and proper that they find a home in the American History Museum. It was also fun to see the the original Star-Spangled Banner (made by Mary Pickersgill, et al, in 1813). There are some snippets of the flag missing, including a star (from right in the middle of the flag!) and a corner of the striped area. My first thought was "Rude! How could someone do that!?" But then, I suppose, that's kind of how the past is preserved. I suppose whoever took those bits of the flags did so to treasure them and to share them, not knowing if the flag itself would be preserved. I then wondered if we did that today—took bits of things to put on display. Modern artifacts, if you will. It was about that moment in my thoughts when I came head to head with one of those wood-paneled Dodge Caravan Turbo minivans that I rode around in when I was a kid and I remembered: We're at the Museum of American History. I was staring at my childhood ride and Chelsea Clinton's ballet shoes were just one floor above me! (Wouldn't it be strange to have your own shoes on display in a museum?) Obviously we collect modern artifacts. Who knows if our collecting will someday be the bane of a collector a couple hundred years in the future? I mean, I hope that we keep them in good enough repair that it won't be...but I can think of several examples where we don't. Like, for example, the bits and pieces of the Parthenon that are scattered around the world. Obviously that scattering happened long ago and I can't decide if we should have them on display of the escapades other nations (Britain, in this example) went through to pillage the goods or if we should return them in order to rebuild the Parthenon. Isn't part of the magic the fact that it's in shambles? I don't know. Pieces of the Twin Towers have been scattered around as well, though they were destroyed in an act of terror, we scattered them ourselves by way of remembrance. We could never rebuild the tower with the bits of rubble we collect. That said, the Parthenon saw its share of battles, too, and complete reconstruction would be impossible. And I really dislike the "rebuilding" of the pyramids going on in Egypt—it looks tacky and modern and insincere. Perhaps destruction is as much a part of history as the original construction. Anyway...are you hungry yet? We were too. So we headed back out to the mall for a picnic. Miriam was in a funny mood—she kept posing for pictures but her poses were always really awkward. I even asked her what she was doing. Her response: "Oh, I'm just doin' a little posin'." She was pretty confident that her posing was super cute. And it was...but it's also a little silly. With the help our our stroller, backpack, and mad balancing skills, we were able to snap a few family pictures. Benjamin was obviously very interested in the ground. While we were standing there, Andrew asked me to guess how long the mall was. "Two miles" was my first guess. 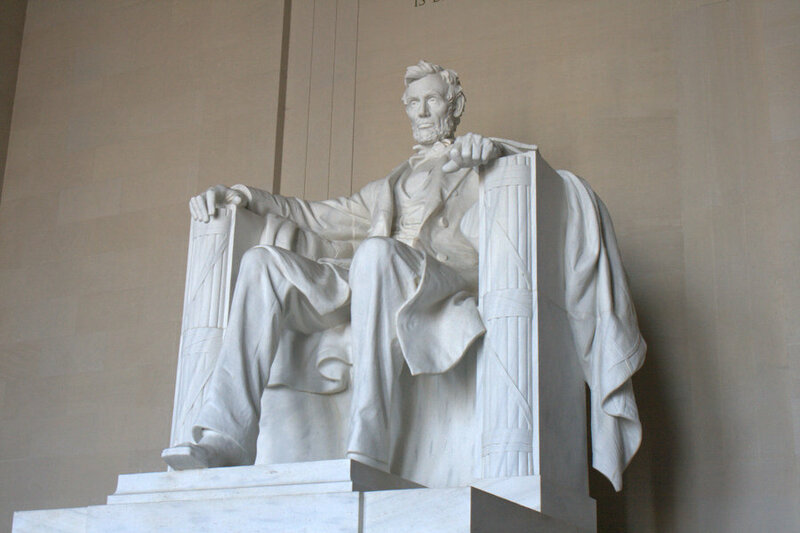 The National Mall is actually 1.9 miles long, from the Capitol to the Lincoln Memorial. If there was a prize I probably would have won it. Two miles isn't all that far, really, but it sure felt like we'd been walking forever toward the end of the day. We took our children from one end of the mall and back again...and then further. We walked up to the Washington Monument, which is monolithic—you can see it from all over the place. It helps that it's up on a hill—you can see all over the place from it, too. We could have gotten closer but we ran out of time. The White House is kind of like Mount Rushmore: You expect it to be bigger than it is. It's actually fairly small-looking, nestled off in the distance between some trees. I'm sure it would have been bigger if we'd gotten around to walking over there (but when Andrew said it was "a thirty minute brisk walk" I said no way—we'd been dragging our kids all over by that point and everyone was beat). So I tried pointing it out to the girls but I'm not sure they noticed it. Rachel agreed to stand still for a picture. I finally caught her racing back to us after we threatened to leave her there to graze on the grass all night. 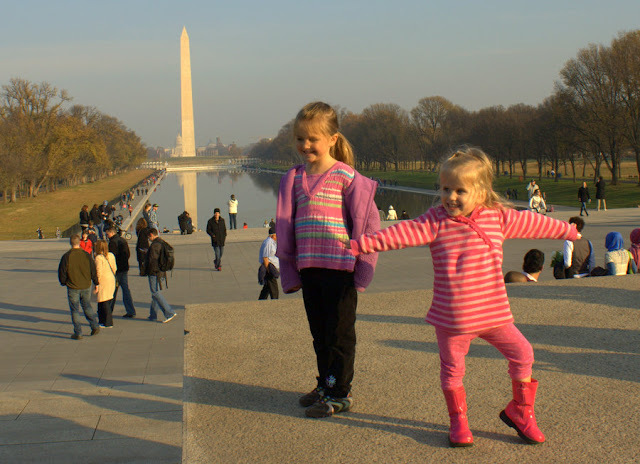 For some reason I thought it was very important that we get a picture of the girls with the Washington Monument. Andrew assured me that we would have plenty of time to do that throughout the day but I didn't quite believe him. This was before I knew that you could see the Washington Monument from pretty much anywhere, obviously. So the girls posed at the base of the monument for me. Miriam did her own little pose until she noticed that Rachel was posing like an obelisk—perfect! She decided that she should imitate this pose. Then they grabbed hands and began to race down the mall together. So Andrew and I followed. They ran all the way down to the street where we demanded that they stop and wait for the signal to change. Then we visited the World War II monument. The kids and I wandered around to explore while Andrew tried to find out why the states were ordered the way they were. I'm not sure he ever found out the exact answer, but it's that they're in the same order in which they entered the union. 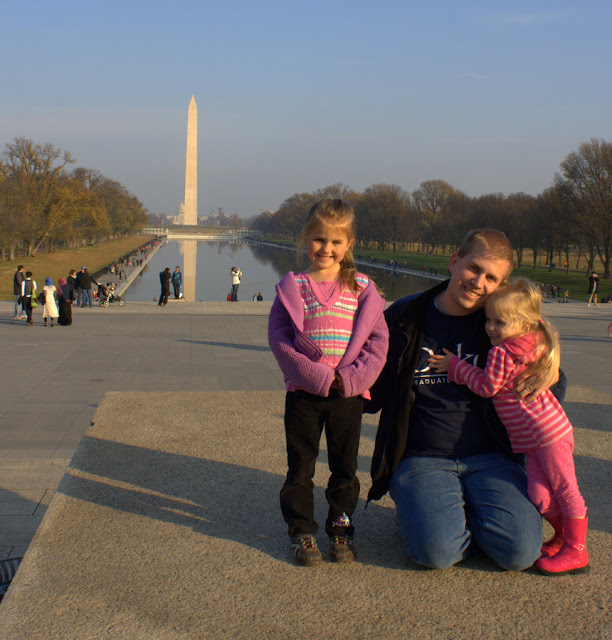 I don't remember quite how it happened, but one minute both the girls were with me and the next minute I only had one of them. Miriam was no where to be seen. My hot pink mess of a child had disappeared! How did I manage to lose something so...florescent?! 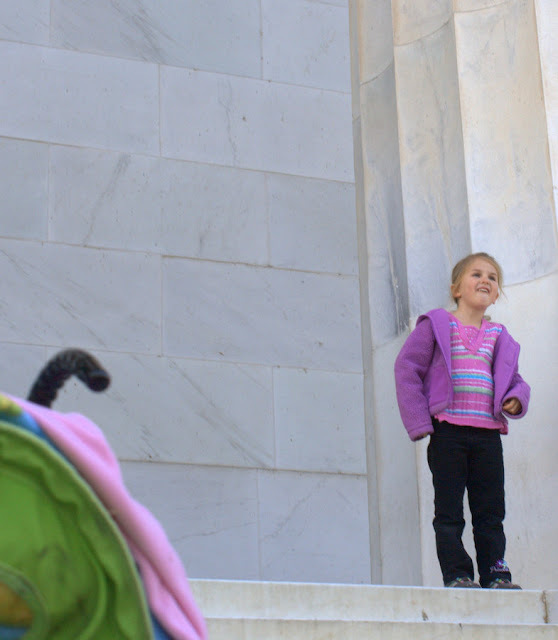 I was already up high so Rachel and I scanned the monument looking for a bouncy three-year-old draped in pink. We saw nothing. (And, no, I didn't snap this picture while we were hunting for her). When we couldn't see her wandering around the fountain we decided to head out into the park. There were two ramps leading up to where we were and both of them lead back down to the fountain—where Andrew was waiting for us and would hopefully spot her if she came down. Rachel and I headed out the archway at the top of the ramp that lead out toward another pond. I looked up and down but didn't see my pink, be-pigtailed princess anywhere. It had only been seconds since she was pulling on my pant leg—she couldn't have gone far. I literally grabbed a woman who I knew had come up the ramp around the same time that the girls and I had and was still admiring the view. "Have you seen a little blonde girl dressed in hot pink, this high?" I asked frantically, indicating Miriam's height with my hand. "Sorry, no," the woman said. Just when I was about ready to tear my hair out and alert the nearest park ranger that there was a missing child and that they had to find her in the next three seconds (or else my heart would break into a million, trillion pieces) that same woman touched my shoulder and pointed off into the distance. "Oh, yes! Thank you!" I gushed. "She's with my husband. Oh, thank you!" Instead Rachel and I (and Benjamin, who was in the baby carrier) rushed down to shower Miriam with hugs and kisses...and to give her the lecture of her lifetime. "Don't you ever, ever, ever leave Mommy's side without saying anything!" was the general message. She knew what she was doing—she was just going back to Daddy. But for ten seconds she was out of sight of either of us and that's not good news. A lot can happen in ten seconds. If I had realized she was missing ten seconds later than I did she probably would have already reunited with Andrew and I wouldn't have panicked and she never would have gotten a lecture but I guess she's too short to be seen while she was walking down the ramp and she wasn't with Andrew when I scanned the fountain area. We're just happy that she knew what she was doing and nothing horrible happened. The whole ordeal lasted less than a minute, I'm sure, but I think I produced enough cortisol to run a small factory in that one minute. She resigned herself to the stroller after her lecture and was hesitant to get out and play. I think I scared her (because I warned her that she could have gotten lost or taken). Eventually she warmed up and started to play again but she was pretty mopey for a while. Constitution Gardens (which is where I thought Miriam might have run off to) was beautiful. There was a dazzling flock of Canada geese on the pond. I wondered why they'd be so far north in December...until I realized that we're not so far north after all. We were all in sweaters and probably would have been fine—though perhaps a tad chilly—in t-shirts. It seems we're far enough south that the birds either live here permanently or are wintering here. And it really isn't a wonder—it's quite lovely out! Most of my Canada goose days (Utah doesn't count because I frankly didn't see many geese there; I did, but not like in BC or DC) were spent in their summer breeding grounds. I never imagined I'd see geese just living it up down south, though I'd read stories about such things. As interested as I was in the geese, however, this seagull was much more interested in us. He was waiting around for us to foolishly open a package of food or something (not that we'd do a silly thing like that) and he wasn't afraid of anything. When some sweet looking mallards paddled up to us, Andrew pulled out some crackers and before I could stop him he opened the bag. I had seen the sign that instructed visitors to the park not to feed the wildlife. "Don't feed the..." I began but then stopped my chastising and simply screamed, "RUN!" No sooner had those pesky seagulls heard the crinkling of a package and caught a whiff of cracker wafting through the air than they descended upon us in a squawking fury of feathers and beaks. We scooped up the children and high-tailed it out of there. "Birds! Don't feed the birds!" I finished, breathless. "Yeah!" Andrew panted. "Found that out." When we'd recovered from our 100-metre dash, we noticed that the lighting was just right to try for another family picture, so we again used our stroller as an impromptu tri quad-pod. I was sad to leave the beautiful pond—even though it was ridden with geese droppings and agressive seagulls—but we had more to see and we were quickly losing daylight. We walked past a few war memorials—like Vietnam. We were all amazed that all those names came from soldiers who lost their lives in one war. Our next stop was the Lincoln Memorial. 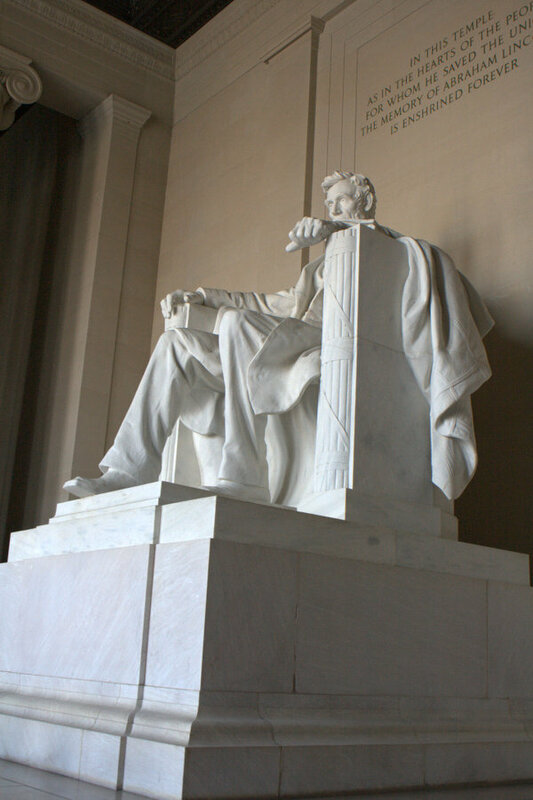 Andrew's been talking about Lincoln since he came home from Indiana (because he treated himself to a movie—Lincoln—while I was at home changing dirty diapers and signing school forms (not that I'm bitter (I'm really not (but it's fun to tease him about it)))) and Lincoln is all over DC. It's like he's one of America's favourite presidents or something. We saw his hat—the hat he wore when he was shot—in the museum earlier in the day and now were coming up to a 19-foot statue of the man. But first—more pictures of the Washington Monument. These pictures were taken at the bottom of the stairs leading up to the Lincoln Memorial. 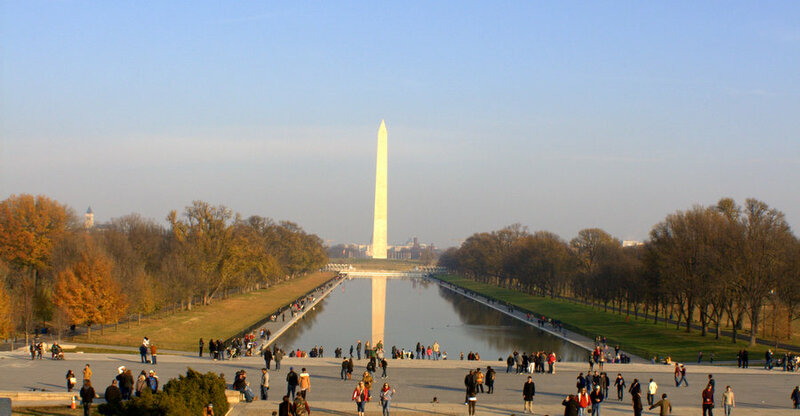 The Washington Monument is 555 ft (and 5 and 1/8 inches) tall. It can seriously be seen from almost anywhere. And it always looks huge. 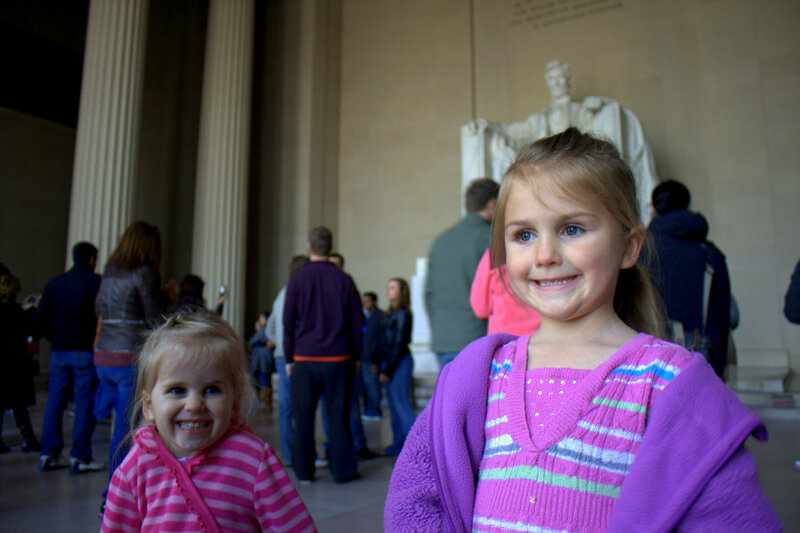 This is the face Rachel made as she gazed out at it from the top of the stairs of the Lincoln Memorial. Inside the memorial the statue of Lincoln is impressive, to say the least. He did some pretty remarkable things. I wish someone would make a movie about his presidency so that I could watch it and learn all about him in an entertaining way... Oh, wait. They've done that. I just haven't seen it yet. Unlike some people I know. The kids and I walked down the steps together while Andrew wheeled the empty stroller down the ramp (he'd carried it up the stairs). We started counting at some point during our descent and got to the number 43. Our fun fact for the moment is that there are several more than 43 stairs leading up to the monument. You're welcome. We stopped at a ranger station (they have those because this is a National Park) to get a map. Technically I stood and waited with the kids while Andrew went up to get a map. When he came back to us he sighed dramatically, "They charged me double because I'm a Duke fan." "So...the map was double free?" I asked. "I guess so," Andrew said. By this point in the day my back was killing me and since Miriam seemed interested in walking we let Benjamin have a turn in the stroller. 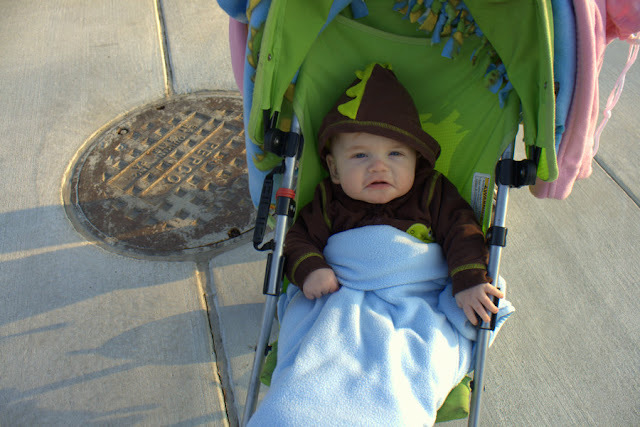 It was his first time riding in our trusty umbrella stroller. I'm pretty sure he loves it (contrary to what his face might tell you). 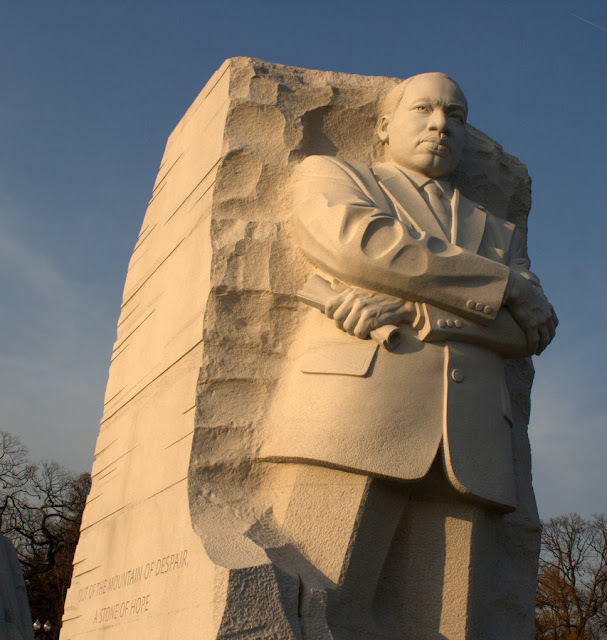 We crossed the street to see the Martin Luthur King Jr. monument, which opened just last year. 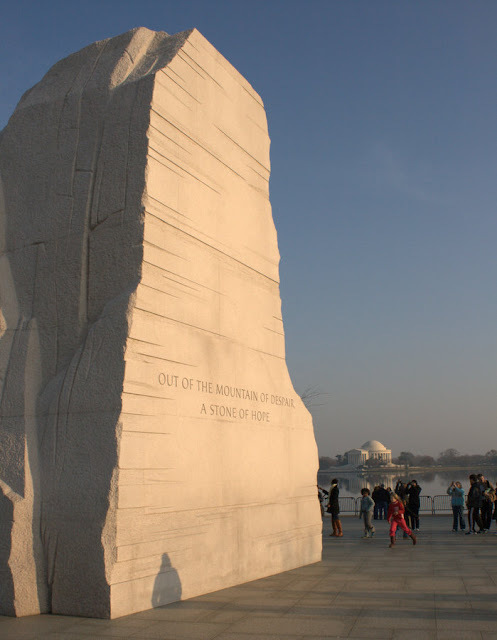 I love the mountain-ish look of the monument, which was clearly based on one of MLK's famous quotes: Out of the mountain of despair a stone of hope. 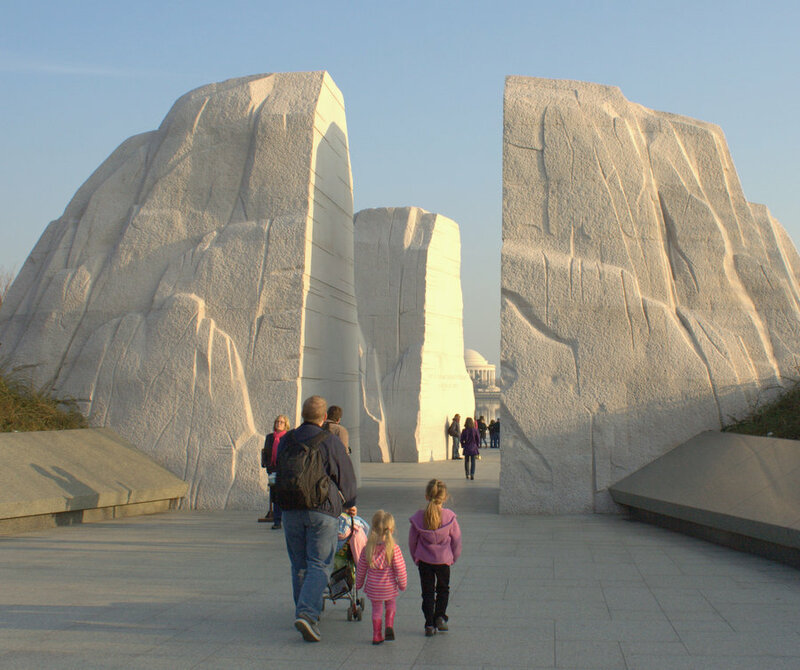 Our friends Blake and Amanda warned us that MLK's statue was...interesting. And it was. He looks just a tad grumpy and imposing. Maybe he's just grumpy that it's taking so long for freedom and equality to be shared around the world. His face says, "Get busy! You still have work to do!" Here are the girls giving some attention to their brother. All three of them were pretty tired of history and were getting pretty hungry. We decided it was time to head to the zoo. The only problem with deciding that was that we still had to walk all the way back up the mall which—did I mention?—is about two miles long. Most of the reason, though, was that they were completely exhausted and couldn't walk a step farther. So we took Benjamin out of the stroller and put him back into the carrier. 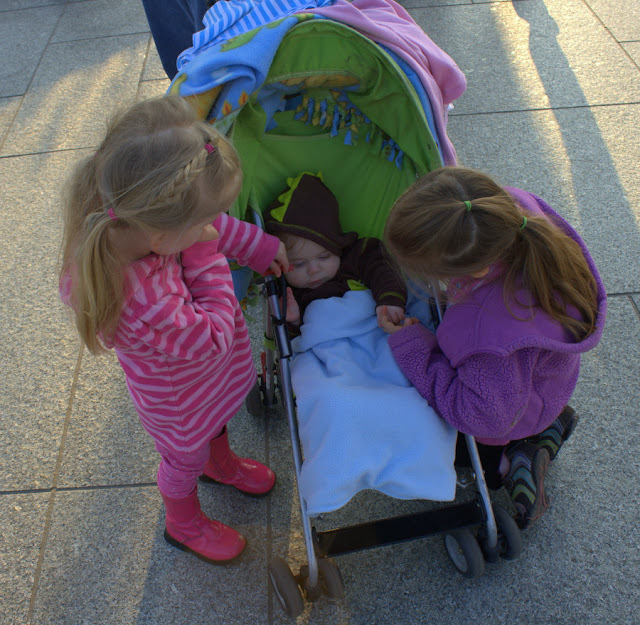 I carried him while I pushed Rachel in the stroller, Andrew put Miriam on his shoulders and we were off again. I pushed Rachel across the bridge leading up to the Capitol Building and then as far as I absolutely could. When I could push her no farther we kicked her out of the stroller and Miriam got in. It was then my task to drag Rachel down the streets of DC until we got to Metro Center, where Andrew planned to catch the train to Woodly Park—Zoo/Adams Morgan. On the way we passed Ford's theater, where you can still go to see a show if you'd like to. We also probably passed several other closer metro stations... It felt like we were walking forever (and I'm twenty-seven so I can only imagine what it felt like for our five-year-old). But we did it! We made it to the metro and then we crashed in our seats. Rachel, suddenly excited to be on the way to the zoo, found her second wind and practically skipped from the metro to the zoo. The first thing we did was pull over to refuel and "winterize." Once we had our extra layers on and some snacks in our tummies we took a lovely stroll through the zoo. We didn't see many animals, though the animal houses were still open, because it was nighttime and the animals were sleeping, even some of the ones I thought were nocturnal. We only went into the small mammal house, truthfully, so I don't know how the animals were behaving elsewhere. The most exciting thing we saw was a porcupine rouse itself from a nap to crack its back, first on the left, then on the right, much like you or I might do. It was an anthropomorphic moment for me, watching that porcupine stretch before going back to sleep. And who knew that porcupines are rodents and have long tails? Not me. We also saw some golden tamarins playing around, which was fun...but the window was crowded with spectators so the girls had a hard time spotting them. We admittedly didn't stay at the zoo long because we got there later than we had intended to and we were absolutely exhausted from our day, so we turned the party around (much to Rachel's dismay—she'd suddenly found enough energy to keep going though Mom and Dad had definitely not) and made our way back to the metro. We had a ten minute wait for our train so we found a bench to sit on and found a discarded newspaper. Rachel picked it up and said, "What's this?" "What's a newspaper?" Rachel asked. "It's a paper...that tells you the news," Andrew explained. "You can order one to be sent to your house but we don't because we just read the news online." Obviously. Since Rachel didn't know what a newspaper was. Everyone was very happy to get back to Amanda's apartment for dinner and bedtime. Even Rachel was happy to go to bed and that is a rare occurrence, let me tell you! Wow. It was almost wearing me out to read about your long day of exertion! But in a fun way! 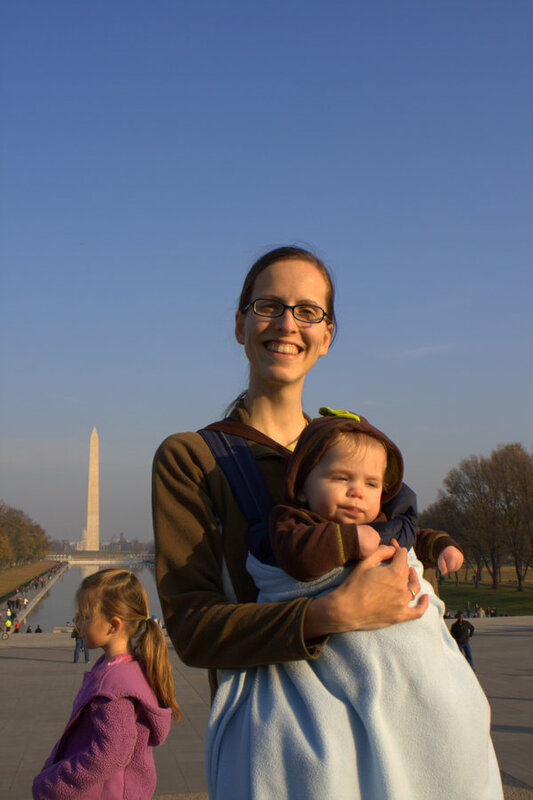 It's funny that you posted that, because I was just thinking earlier today about how fun it would be to take our kids on a Washington DC vacation (museum nerds that we are). Seeing as we don't live half a gas tank away, though, I think we'll wait until Espen and Gwen are old enough to a) remember it, and b) haul their own little bodies around. I can only imagine how exhausted you must have been!